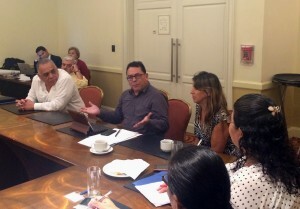 On July 12 and 13, 2016, the Auschwitz Institute for Peace and Reconciliation (AIPR), in collaboration with the Ombudsman’s Office of El Salvador (PDDH), organized the first meeting regarding a project entitled “Education, Human Rights, and Prevention” in the city of San Salvador, El Salvador. This project, the first to be developed under the banner of AIPR’s new Educational Policies Program, has the objective of designing a pair of educational projects with a preventive dimension in two member countries of the Latin American Network for Genocide and Mass Atrocity Prevention. Additionally, over the long term, AIPR hopes to develop a working methodology that will serve to facilitate the implementation of similar activities in other parts of the world, as well as consolidating a new thematic area for cooperation and for the development of policies on prevention. The project on Education, Human Rights, and Prevention was officially launched in June of 2015, when it was presented for the first time at the IV Focal Points Meeting of the Latin American Network in Santiago, Chile. At the meeting, a call was made for the submission of applications by member countries interested in implementing this project in their home country. This process concluded in April of 2016, with Brazil and El Salvador being formally named as the two countries chosen for the proposal. In this context, the meeting organized in El Salvador functioned as the first event in a larger process that will take place over the next two years. During this period, the two initial educational projects, in Brazil and El Salvador, will be developed in a consultative and participative manner. These projects will be aimed at serving children and young people and designed specifically to respond to the historical, cultural, and social realities in the two countries. 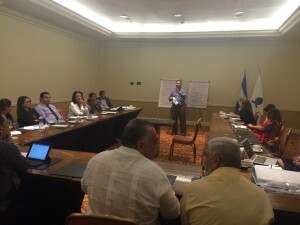 Thus, the one-and-a-half-day meeting included the participation of 35 representatives from the education community, civil society, and various public institutions in El Salvador as well as several observers from international organizations. The primary objective of the event was to discuss and establish the initial parameters of a work proposal that would later be developed by a group of subject matter experts. The meeting was officially inaugurated by the Prosecutor of the PDDH, David Ernesto Morales, and Eugenia Carbone, Director of AIPR’s Latin American Program and Technical Secretariat of the Latin American Network. The event also involved the participation of Vivian Salazar Monzoni, a representative of the International Institute for Learning on Reconciliation (IIAR) in Guatemala, who shared experiences in her country on the themes of education and memory. The working group for the project is comprised of Dr. Clara Ramírez-Barat, the Auschwitz Institute’s Director of Educational Policies, Antonio Aguilar Martínez, Deputy Prosecutor at the PDDH, and Dr. Raúl Moreno Carmona, the Director of the PDDH’s School of Human Rights. Dr. Ramirez-Barat believes that the meeting was successful in accomplishing all of the objectives that had been identified for this initial period of the project. “We are hoping that this project can add to and strengthen the country’s important existing initiatives in order to consolidate a culture of peace and respect for human rights,” she explained. The next meeting scheduled for the project will take place in Brazil in the autumn of 2017.